Let us make your night memorable! We offer a premium selection of spirits, wine, beer, a small plates menu and full catering. Boasting incredibly talented and professional staff as well as an intimate, laid back atmosphere. With versatile audio system and a 100 inch projection screen, we are sure to make your night one to remember. Hello Everyone! This space is located in a prime area directly across the Weylin, and neighbors to Velvet Brooklyn Lounge and Peter Leuger's. 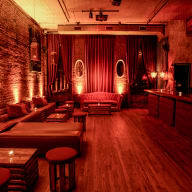 Nearby are multiple bars, trendy restaurants and cafes, the Williamsburg bridge, public parks and social spaces. It is easily accessible by car and there is available street parking and parking lots nearby. The bus station is a few feet away, and the most convenient trains (M/J service) is 3 blocks away. This space is a hidden gem for photographers looking for an ideal photo/film shoots, productions, and off-sites. It is decorated with designer furniture and equipped with amenities, and the people in the area are some of the friendliest, most welcoming people you'll meet. The loft is situated on high floor, giving lots of natural light, with Brooklyn & Manhattan views. I hope you can consider the space for your needs, and wish you to enjoy yourselves! For all Film/Photoshoot inquiries, quotes will vary.